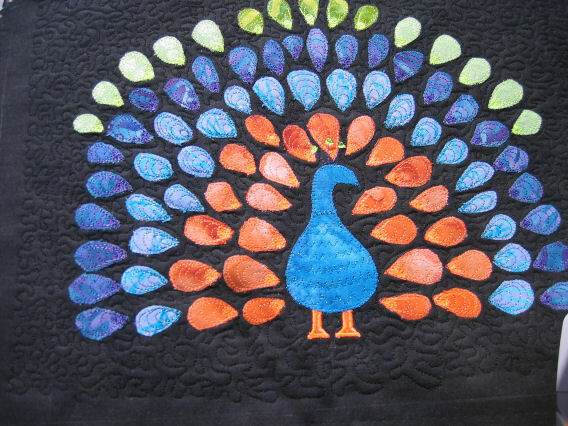 I had it in my head to make a stylised peacock from jewel-coloured fabric scraps. So after letting my brain consider the idea for a few weeks, I started my peacock a couple of weeks ago — and finished him today. I didn’t have a pattern — I just made him up as I went along! Decided on the colours for the ‘feathers’. I picked several batiks in various shades of orange, aqua, purple and green. The reason I chose batiks was because they already have colour variation in them — they aren’t flat colours. I hardly put a dent in my scrap bins…. Decided on the colour for the background. I chose plain black as I figured it would set off the jewel colours better than white or cream. Repeated step 3, but this time for the peacock’s body and legs/feet. Fused very light fusible interfacing to the black background to stabilise the fabric. 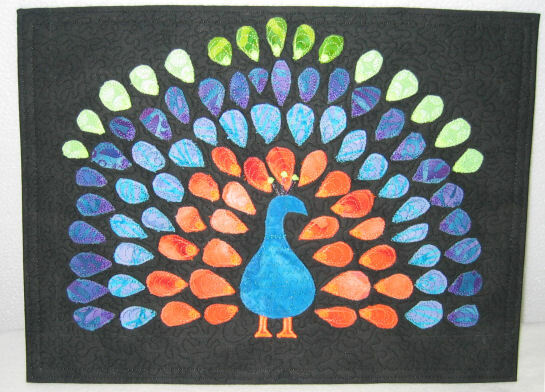 Marked up the black fabric with centre lines and ‘borders’ into which the peacock and all his ‘feathers wold fit. 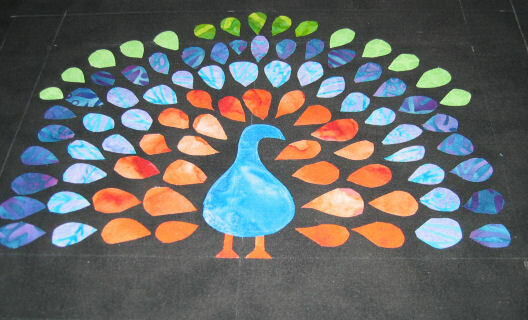 The centre line was for the placement of the peacock’s body and feet. Fused the legs/feet, then the body to the background. Arranged the teardrop shapes around the peacock then picked off the fusible webbing from the back of each teardrop shape, then fused it in place. Free motion stitched radiating ‘circles’ coming out from the point of each teardrop shape, in a matching thread for the fabric. I used orange and green neon threads for the shapes in those colour; blue metallic thread for the aqua shapes; and purple rayon thread for the purple shapes. Stitched down the raw edges of each fused applique shape with a tiny blanket stitch, using an invisible monofilament thread. Free motion stitched a spot at the teardrop end of each shape in the same thread as the radiating ‘circles’ for that ‘feather’. Stain stitched the raw edges of the legs/feet in neon orange thread. 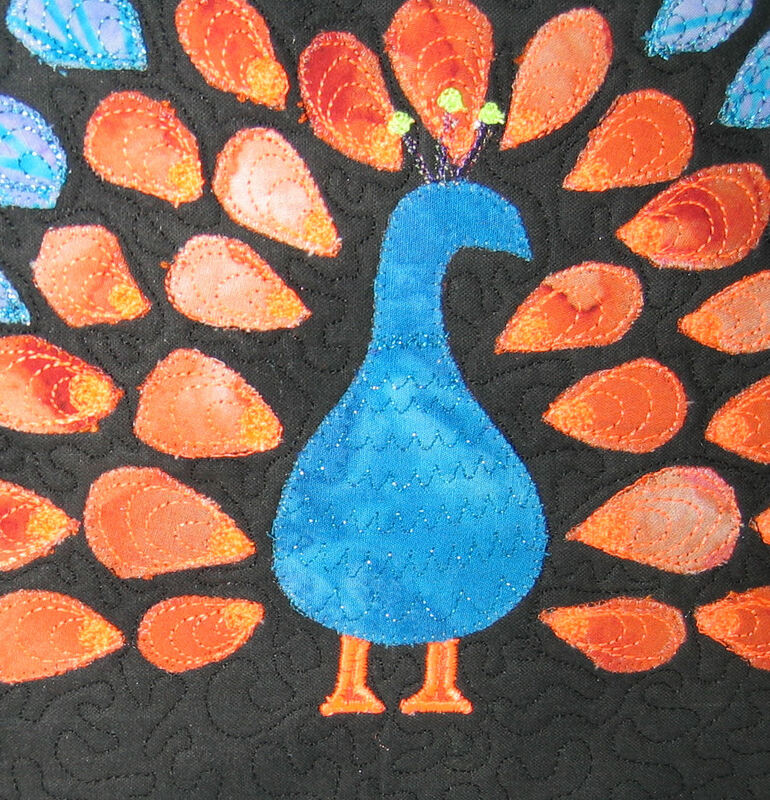 Used a blue metallic thread and a U-shaped stitch to stitch the peacock’s body. Added a ‘collar’ in the same blue metallic thread. Stitched bobbles on top of the peacock’s head. 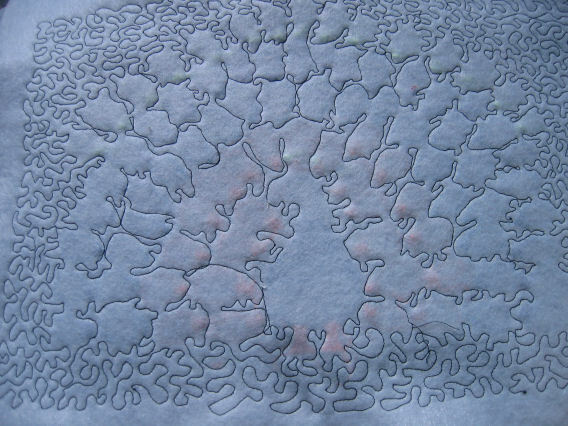 Stitched down the raw edges of the body with a tiny blanket stitch, using an invisible monofilament thread. Cut a piece of thin batting (non fusible) the size of the background fabric, then basted it down. As I wanted to finish the edges by turning them over to the other side, I needed to leave an area unstitched when I stitched the layers together. I ‘eyeballed’ a spot about 1 inch in from the edge of the black fabric, then tightly stippled the entire black background and the areas between the ‘feathers’, making sure I left at least 1 inch of the black fabric near the edges free of stitching. Squared up the piece, then cut away the excess batting from the back of the 1 inch ‘open’ edges of the black fabric. Cut a piece of stiff fusible interfacing the size of the stitched area (it was 10 x 13 inches), positioned it squarely on the back of the stitched area, then fused it down. Turned the excess black fabric over the edges of the interfacing (like a hem) and pressed it down. Cut a piece of backing fabric about 11 x 14 inches, then turned under 1/2 inch hems all the way around the rectangle. Laid the wrong side of the backing fabric over the back of the main piece and pinned it in place so that no backing fabric was exposed and all the tucked under black fabric ‘hems’ were covered. Using black rayon thread, I then top stitched 1/2 inch in from the edge of the completed piece, then added another length of top-stitching 1/4 inch from the edge. This secured the backing fabric to the main piece and finished off the edges of the main piece. Finally, I sprayed the whole piece (back and front) with fabric protector and added my ‘Resplendent Peacock‘ to my Etsy store. Unfortunately, the colours as rendered in the photograph just don’t do the real colours justice — they are much more vibrant than shown in this photo.